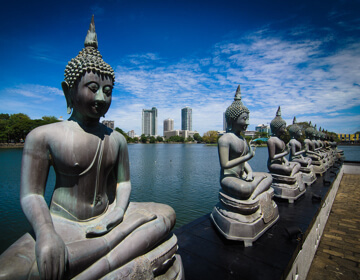 A modern metropolis full of a vibrant energy, Colombo has a rich history & culture that blends seamlessly with entertainment, dining & shopping hubs. As one of the most centrally located Colombo hotels, we offer easy access to many of the city’s main attractions. 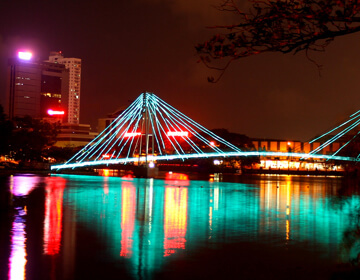 Stay at Ramada Colombo and discover Sri Lanka’s commercial capital like never before. Galle Face Green lies just across the road from our hotel and features a long stretch of lawn and promenade area right by the sea. A popular place to hang out, have family picnics and fly kites, it is also well known for being a hotspot for delicious Sri Lankan street food. Lying in the heart of Colombo, the Beira Lake is surrounded by tall shady trees and offers a relaxed haven amidst the hustle & bustle of the city. It is a great place to enjoy quiet walks, visit sacred sites or even take swan boat rides along the tranquil waters. 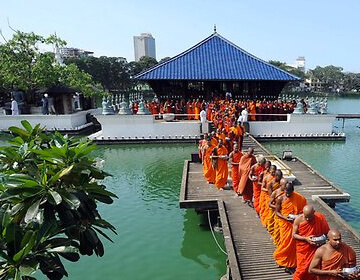 Located near the Beira Lake, the Gangaramaya Buddhist Temple is a sacred site that has traditional architectural elements not only from Sri Lanka but China and Thailand as well. Featuring an old Bo tree, the temple also has a fascinating range of religious statues and artefacts worth seeing. Positioned on a floating platform on the waters of Beira Lake, the Seema Malakaya offers a serene escape from the city. Designed by famed Geoffrey Bawa, this site was built as an assembly hall for Buddhist monks. Lit up at night, it also features rows of statues depicting Lord Buddha. 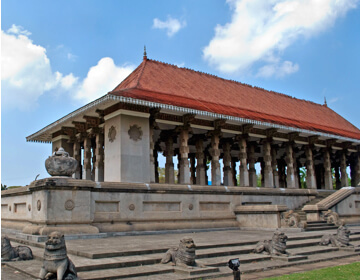 Offering insights into the island’s history and heritage, the Colombo National Museum features a fascinating array of historical artefacts. 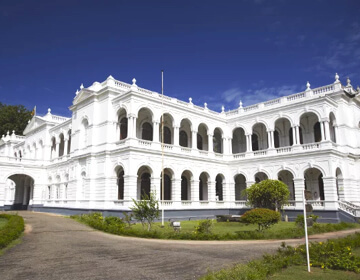 Within the museum, one will find everything from antique statues & carvings to weaponry as well as exhibits from Sri Lanka’s ancient kingdoms and colonial era. A lush oasis in Colombo, the Viharamahadevi Park is set amidst beautifully landscaped parklands. A popular place for families and those in search of a laidback escape, the park has playground areas for children, plenty of pathways for relaxed walks and tracks for cycling too. On one side of the park, a popular street art exhibition takes place during the weekends. 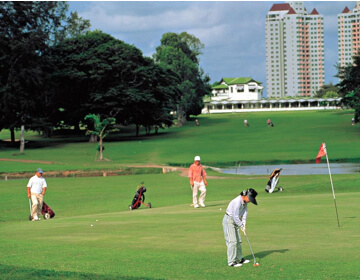 The 18-hole Royal Colombo Golf Club enjoys a convenient location in the city and offers picturesque fairways and greens from which to tee off. The second oldest Royal Golf Club situated outside the UK, this historic club also has a fascinating collection of memorabilia to add to the sense of old world charm. 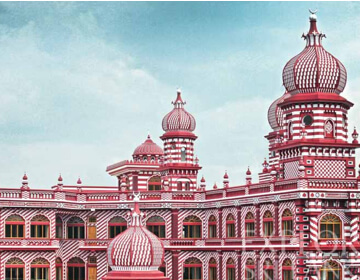 Known for its distinctive exterior featuring red and white striped bricks, the expansive Red Mosque is an unmistakable sight in Pettah. A historical monument that dates back to the early 1900s, it is one of Colombo’s oldest mosques and also has unique domes that have been designed based on a pomegranate’s shape. 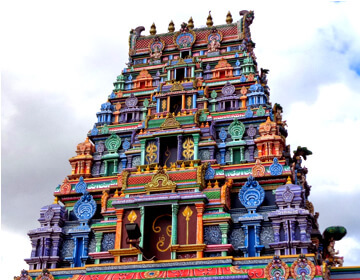 Located in lively Pettah, the Old & New Kathiresan Temples are Hindu kovils that feature ornate exteriors with carvings of a multitude of gods. Built in honour of Murugan (Skanda) who is the War God, these temples give visitors a chance to witness the rituals and customs of devotees, especially during the annual Vel Festival. Dating back to 1749, the Wolvendaal Church was constructed during a period when the area was covered in marshland. 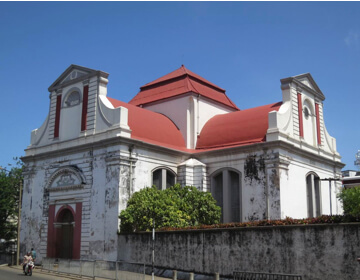 One of the island’s oldest protestant churches, this historic structure was designed to resemble a Greek cross and highlights include an old church organ, ornate pews & a unique stone floor with tombstones of past Dutch governors. 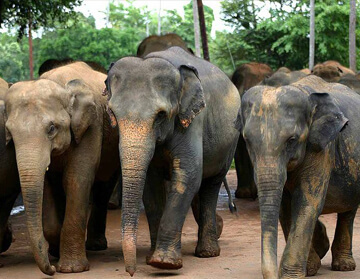 Home to a fascinating range of animals great & small from around the world, the National Zoological Gardens is one of Colombo’s most popular attractions. This expansive zoo features different themed sections playing host to everything from primates to large mammals and birds to reptiles, offering a fun-filled family adventure. Mt Lavinia beach, Mount Lavinia. 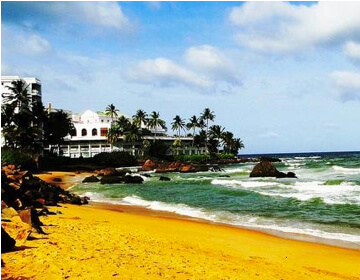 Sun drenched shores and plenty of golden sands by the Indian Ocean await at Mount Lavinia. This laidback coastal stretch is also lined with restaurants and dining venues where you can enjoy delectable seafood and drinks with family & friends. 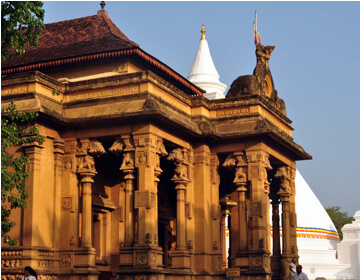 Nestled on the Kelaniya River banks and possessing a history of over 2,500 years, the Kelaniya Temple is amongst Sri Lanka’s most revered Buddhist sites. Visitors to the temple have much to see including ancient murals and paintings depicting scenes from Lord Buddha’s life, ornate sculptures and a large Bo tree in the courtyard. 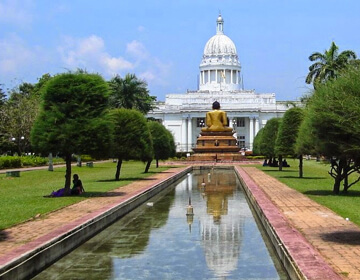 Built to commemorate Sri Lanka’s independence from British colonial rule, Independence Square has become a popular place in Colombo for family outings and those looking for a quiet getaway in the city. Featuring the Independence Memorial Hall with its traditional design elements, Independence Square is also a well-known spot for jogging, walking and cycling. 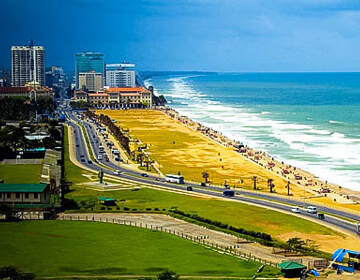 Located by the harbour, Colombo Fort is where you will find the country’s Central Business District. 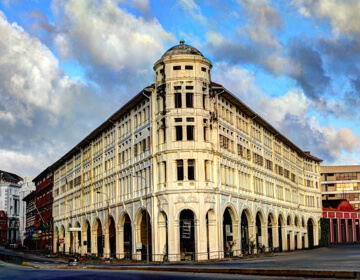 This financial hub has an old world charm of its own and amidst a bustling corporate world, you will find colonial landmarks such as the Old Parliament Building facing Galle Face, the Old Colombo Lighthouse and the Old Dutch Hospital which is now a dining and retail hotspot. A bustling outdoor bazaar full of colour (and sometimes chaos! 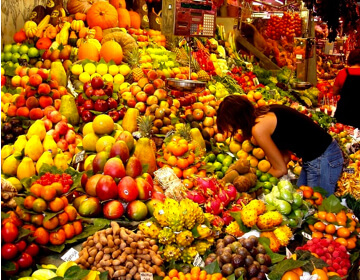 ), Pettah is made up of a maze of streets and roadside shops, each offering something new to discover. Shopping in Pettah is an adventure in itself with almost everything imaginable on sale. Each area has its own speciality; clothing at Main Street, bags & shoes at Front Street and electronic items at First Cross Street to name just a few. Sri Lanka’s administrative capital, Sri Jayawardenepura, Kotte is a lively city that offers much to see and do. 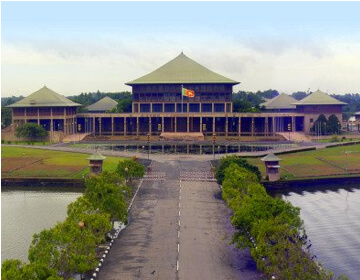 This part of the city is also home to the Parliament of Sri Lanka, designed by Geoffrey Bawa and located by the scenic Diyawanna Lake. Kotte is home to picturesque parks and lush stretches of greenery by the lake with walking and cycling tracks and boat rides offering plenty of recreation. There is even a model village showcasing traditional artisans at work and rustic village life.